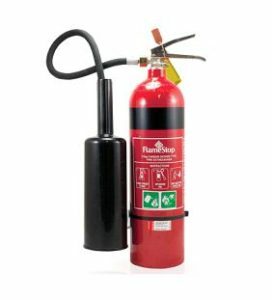 A fire extinguisher is usually the first line of defence if a fire breaks out in your home or business. It needs to be the correct type and in a suitable location for easy access and coverage. A common scenario most technicians come across during routine inspection is that CO2 extinguishers are being taken off / knocked off the wall brackets and left on the floor or hidden behind doors. The main cause of this is due to the design; the hoses are long, the delivery nozzles bulky, they take up a lot of room on the walls and are a potential trip hazard. Staff are removing or relocating extinguishers thinking they are helping when in fact, if a fire breaks out and an extinguisher cannot be found, they are putting themselves and others in danger. 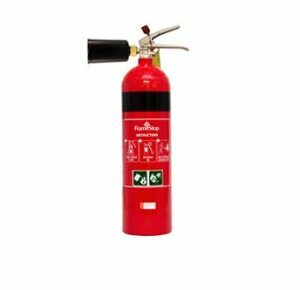 FlameStop manufactures its own range of extinguishers and has come up with a new design of nozzle to combat these issues and more. Another benefit of this design is that it makes it even easier for the user to extinguisher a fire. The fixed nozzle now allows the fire to be extinguished using just one hand if necessary, freeing up the other hand to call “000”.